OK, I realize I'm SEVERAL months behind in my favorite little baking group, The Cake Slice Bakers. I've been so incredibly overwhelmed that I've completely neglected this interactive monthly baking group for oh so long. However, my mini hiatus has come to an end. What better time to start back up being that I'm in my Advanced Cakes module in culinary school...? Any excuse to bake cakes, consider me in! 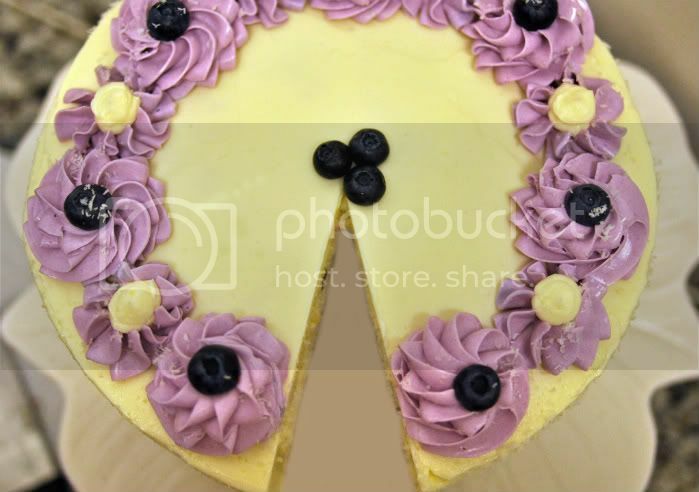 Well, I'm back and better than ever and began catching up with July's cake which was posted on the 20th; marbled lemon blueberry buttercake. Luckily I already made August's cake selection; Pistachio Petit Four cake, last year so I'm up to date for September. Wow, I came back just in time because this cake was absolutely fantastic. 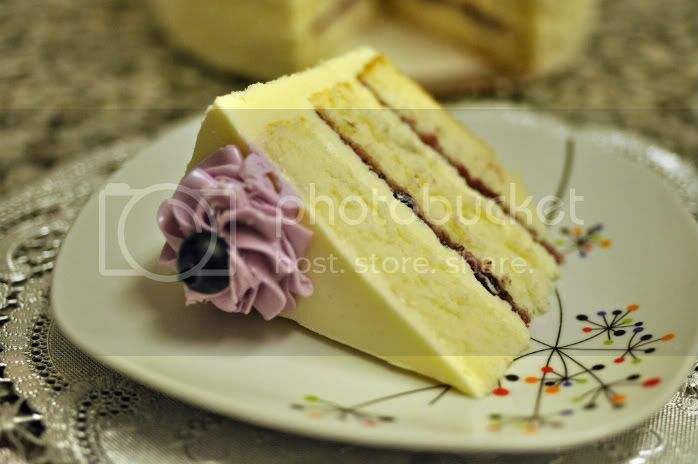 It was very similar to the base of Dorie's perfect party cake with an added marbled blueberry throughout, a homemade lemon blueberry puree, and a lemon swiss meringue buttercream. Mmmm mmmm delicious! I went the extra mile and made my own lemon swiss meringue buttercream. The original recipe called for whole eggs and I'm really not a fan of that kind of buttercream. I stuck shaved coconut around the sides of the entire cake and colored a portion of my buttercream purple to pipe across the top. I sprinkled a touch more coconut on the rosettes and stars and dropped a blueberry on each, as well as 3 in the center. I had dinner with my 94 year old grandma last week in the city and brought her this cake. For a woman who weigh 85lbs and doesn't have much of an interest in food, she sure scarfed this cake down faster than you could imagine. She called me the next morning to inform me that she had it for breakfast as well. 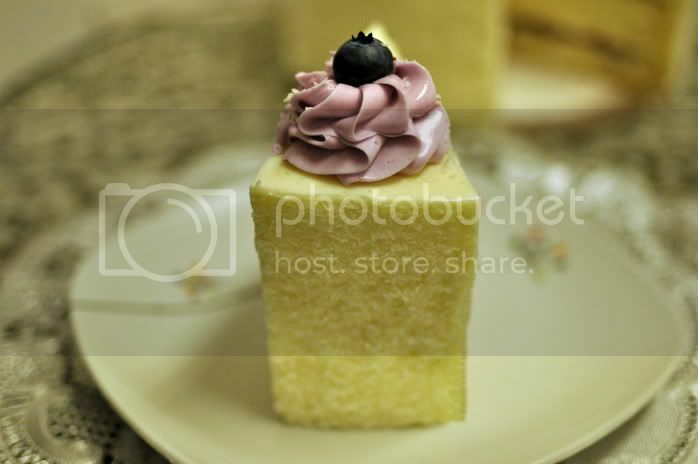 Go ahead and check out the cake slice bakers blogroll and become a member today. We'd love to have you! September's selection features Sky High's triple chocolate fudge cake. Keep your eyes peeled! Preheat the oven to 350 degrees F. Butter the bottom and sides of three 8 inch round cake pans. Line the bottom of each pan with a round of parchment or waxed paper and butter the paper. In a mixer, cream together the butter, sugar, lemon zest and lemon extract until light and fluffy. Gradually add the egg whites 2 or 3 at a time, beating well between additions and stopping occasionally to scrape down the sides of the bowl. Combine the flour, baking powder and salt, whisk gently to blend. In 2 or 3 alternating additions, beat the dry ingredients and milk into the butter mixture, scraping down the sides of the bowl several times. Beat on medium-high speed for about 1 minute to smooth out any lumps and aerate the batter. Scoop 1 cup of the batter into a small bowl. Divide the remaining equally among the 3 prepared pans, smoothing the tops with a spatula. This gives you a smooth surface to work with. Add 2½ tbsp of the lemon blueberry preserves to the reserved batter and blend well. Drizzle heaping teaspoons of this blueberry mixture over the batter in the pans. Use a skewer to swirl the blueberry mixture in short strokes to drag it down through the lemon batter without mixing it in. Bake for about 25 minutes or until a cake tester or skewer stuck in the centre comes out clean and the cake pulls away from the sides of the pan. Lat the layers cool for 10 minutes before turning out onto a wire rack, peeling off the paper and leaving to cool completely. Puree the blueberries with any juices that have exuded in a blender. Pass the puree through a coarse strainer to remove the skins. In a heavy medium saucepan, combine the blueberry puree with the sugar, lemon juice, zest and ginger. Bring to a gentle boil over a medium heat, stirring often for 20 minutes, or until the preserves have thickened and are reduced to 1 cup. To check the proper thickness place a small amount of a saucer and put in the freezer until cold. Drag your finger through it. If a clear path is made through the preserve then it is ready. Let the preserves cool before using. (Can be made up to 5 days in advance). In a small saucepan, combine the sugar and water. Bring to the boil over a medium heat, stirring to dissolve the sugar. Continue to boil without stirring, occasionally washing down the sides of the pan with a wet pastry brush until the syrup reaches the soft-ball stage, 238 degrees F on a candy thermometer. Immediately remove from the heat. In a large mixer bowl with an electric mixer on medium speed, beast the eggs briefly. Slowly add the hot syrup in a thin stream, pouring it down the sides of the bowl; be careful to avoid hitting the beaters or the syrup may splatter. When all the syrup has been added, raise the speed to medium,-high and beat until the mixture is very fluffy and cooled to body temperature. This can take 15-20 minutes. Reduce the mixer speed to medium-low and gradually add the softened butter 2 to 3 tablespoons at a time, beating well between additions. As you’re adding the last few tablespoons of butter, the frosting will appear to break, then suddenly come together like whipped butter. Beat in the lemon juice, and the frosting is ready to use. To assemble the cake, place a layer, flat side up, on a cake stand. Spread half of the lemon blueberry preserves over the top. Place a second layer on top of the first and spread the remaining preserves over it. Finally place the third layer on top and frost the top and sides with the lemon buttercream. Decorate with fresh blueberries and serve. Makes one 8 inch triple layered cake. You picked a fine time to come back because this cake was SO good. This was one of my absolute favorites! You did a beeautiful job decorating it! Okay this is possibly the prettiest cake I have ever seen. No wonder your grandmother scarfed it down, I am going to make this next time I make a cake! Beautiful pictures and thanks for the great recipe. Beautiful! The blueberry and lemon combination is great and I love the colors. Your attention to detail is amazing as is your workmanship! GREAT JOB! That has got to be the nicest Sky High Blueberry cake I've ever seen! Truly - I made that last year, looked nothing like yours! I love that book... and glad I found your blog. VERY wonderful cakes!!! I've got to make this cake, as I missed it the other month for The Cake Slice. I'm buying blueberries every week with the intent to make it, but of course I find an excuse to flake. 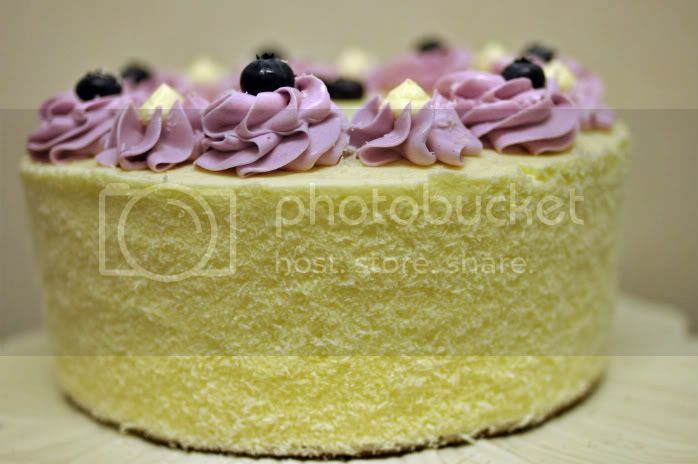 Looking at your pretty and delicious looking cake is motivating me to make it this weekend! Holy Moly!! That cake is stunning and it sounds divine. Howdy, ive just come across your blog, and must say this cake looks amazing! i love blueberries, i bet it went perfectly with lemon. As they say: better late than never! Your cake is so pretty and this tasted so good. Hey Meliss, what that coconut you use on the side of your cake? The Cake is soo beautiful! I got that coconut in the 'foreign foods' section of my extremely diverse grocery store. It was super small shredded pieces that almost looked like sprinkles. The package is written in Spanish if that helps ;).